The Adventurer goes to the Big Trees – Calaveras Big Trees that is. These are some really big trees! Our latest installment of short trips is what follows. For those of you that have been reading along as we put our rig through its paces, welcome back. For those of you just joining us, pull up a chair and travel with us as we go down some roads less traveled and some that everyone knows…..
We had a long weekend at the end of October. For those that do not live in Nevada – we celebrate our States Birthday. What makes it all the more interesting is that Nevada Day is in reality on October 31st. That’s right, Halloween… kind of fitting. We entered the Union on October 31, 1864 and are proud of it. There are many tales to tell …. Some true and some not so true…. about the why and when. But those are stories for another day. We start out our excursion as always from the Reno, Nevada area. We head south on US 395 and taking Hwy 88 to Hwy 89 and then the route over the mountains on SR4. 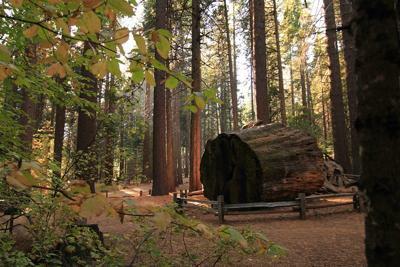 Calaveras Big Trees State Park is our destination and is located off SR4. 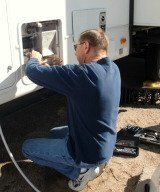 A word of caution and warning as this route is not designed for large rigs. As a matter of fact, rigs larger than 25 feet in length are strongly discouraged. It also closes in winter because of the great amount of snowfall. For those who have toads – you can park your rig at a park in Carson City and take the toad over the mountain to Big Trees. Additionally you can take an alternate route if you chose – this a spectacular Park and should be seen if you are traveling in the area. Great thing about this route, if you have the time you can stop near Genoa and visit a nice State Park as well. More on that location another time. 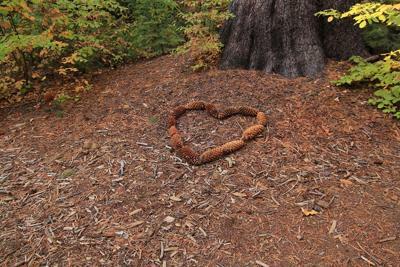 Our trip over the mountain to see the Big Trees was uneventful – but not for the faint of heart. This routes peaks at 8730 feet at Ebbetts Pass. Lots of hairpin turns and in many places the road is about a car and a half wide. There isn’t even a center line on the road! But there are numerous hiking trails along the highway - and a few pullouts for picture taking as well. A bit of a history lesson here…. Ebbetts Pass was originally recommended to surveyor GH Goddard as a route of great promise for the Transcontinental Railway by Major John Ebbetts. The Transcontinental Route eventually was chosen and Ebbetts Pass was not selected. The pass was used by Stages and serviced Silver City. Along the route there are many small unimproved campgrounds – that can be used for a minimal cost. One of my favorites was the quite small setting at Mosquito Lakes. Prices for use are posted on the Restrooms and are paid through the honor system. They do have regular site drive bys to confirm fees are paid. Our travel time was a little more than 4 hours…. and a beautiful one at that. 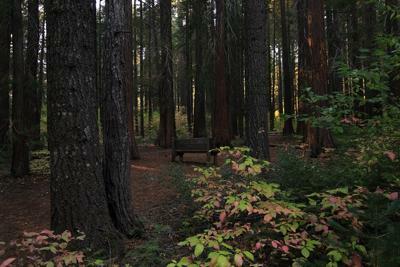 We arrived at Big Trees shortly after noon and did a drive through the camping area looking for a spot that was convenient to the trails we wanted to hike and to other park amenities. We decided on the loop closest to the Park entrance as it had meadow access and trails access nearby. They have a very nice Visitors Center with a small store on the premises that sells various logo items. They also have a small museum type exhibit that was very informative. While the fees are a bit high considering there are no hook-ups, the surrounding trees and wildlife make it worth the extra expense. After checking in, we decided to have our lunch and then hike the trails. The first trail was an interpretive one with lots of great info and interesting facts. This is just a short one – but made for a nice warm up for the longer hike we would take next. For those who have never been to this park, I want to tell you that it is very well maintained and the trails were even and easy to walk. This park is about 6,000 acres and actually has two groves of these spectacular big trees. There is North Grove (where we stayed) and the South Grove. While the South Grove has bigger and grander specimens, this portion of the park was closed to camping this time of year. We will return another time to see these great trees. A guide can be purchased at the Visitors Center or at the Trailhead for a nominal fee - just fifty cents at this writing. There is some uncertainty as to the actual first white settler to discover these magnificent trees… but whoever is given credit, we are all thankful that they have been preserved for future generations. This site is recognized as the longest continuous operated tourist attraction in California. Many of the trees are greater than 250 feet in height with diameters exceeding 25 feet in circumference. The Big Trees trailhead through the North Grove starts near the Discovery Tree. The Discovery Tree was taken down in 1853 to create a dance floor in the woods. It took over three weeks to saw through the massive trunk. John Muir wrote of it in later writings lamenting that such a thing was done to such a beautiful tree. There were parties held at the tree with illustrations of up to thirty two revelers dancing upon the stump. There was even a pavilion built over the stump in 1856 to keep out inclement weather. Other additions show that there was also a bowling alley and saloon erected at the tree site. As we continued our walk through Big Tress, we came upon the Father of the Forest which has a path through it and is said to have fallen centuries ago. There is also the Pioneer Cabin Tree which was originally created to compete with the trees of Yosemite National Park. Unfortunately the tree is slowly dying as the result. It can no longer support its growth and has become less resistant to fire. There is a stop along the trail that allows for an up close view and sensory experience. After our walk we returned to the Adventurer and had a campfire and a delicious dinner. My theory on that is that if you eat it and nobody dies, it had to be good, right? The campground loop filled up quite a bit while we were on our hike but they provide enough space between sites that this was not an issue. So in conclusion, this was a great place to get away for a long weekend, relaxing amongst the majestic trees and enjoying nature. With weather turning colder here in Northern Nevada we will have to park the Adventurer for a bit, but we’ll be back on the road soon. Next trip for us is a Western Caribbean Cruise onboard the Carnival Dream. For those who have enjoyed this writing, look for my review of that trip at cruisecritic dot com under the handle Sparkscruiser. Until we travel together again, stay safe. And explore what this great land has to offer. 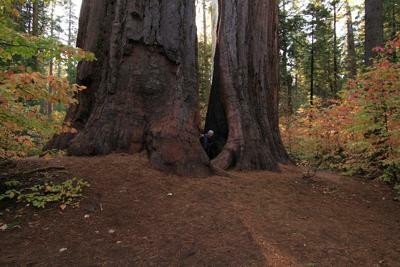 Comments for The Adventurer goes to the Big Trees – Calaveras Big Trees that is. Laurie that is a great article. It seems to me that you have been working hard on getting good and accurate information arranged in a sensible fashion. Articles at Suite 101 are limited to 1000 words max so just a heads up on that.